Yesterday afternoon Naoto and I popped over to the garden and planted MOST of our garden. It was the perfect day for planting–warm, sunny and quiet in the garden. It was nice to be there with Naoto…and not just because he did some of the heavy lifting! We both quickly realized that this whole gardening hobby could be a lot of fun this summer–and probably could be pretty rewarding as long as we actually grow something! We pulled weeds and added a little bit more mulch to our plot before we got started. Then, Naoto dug holes for me and I planted our three tomato plants (two Big Boys and one Brandywine) and our pepper plant in the south end of our plot. 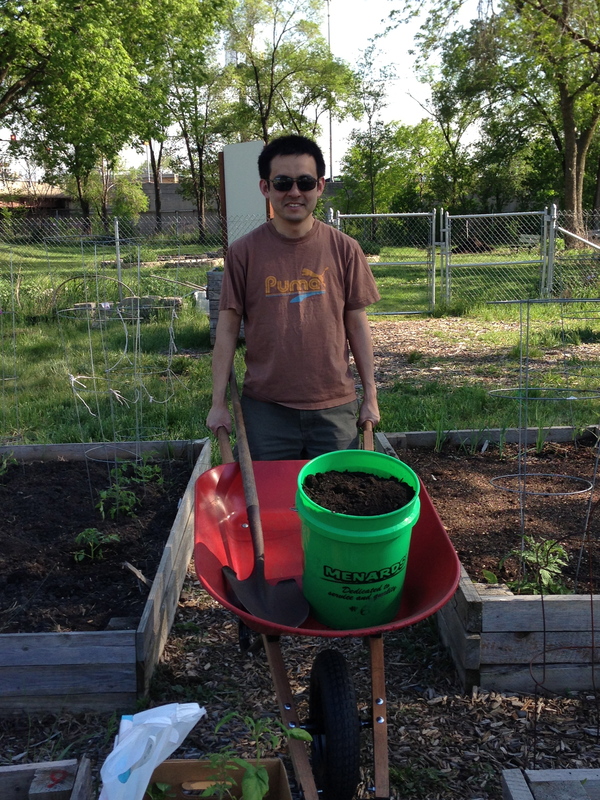 Then, while Naoto weeded around our garden plot (the man was a weeding maniac! ), I planted our Japanese cucumber and our luffa seeds in the North part of the garden. (Yes, we are going to try to grow our own loofah sponges…a totally weird experiment that I just couldn’t resist!) Our watermelon is going in this neighborhood, too, I just forgot the seeds at home. Then, in the center of the garden, we planted our daikon, watermelon radishes, lettuce, golden beets, limas and peas. 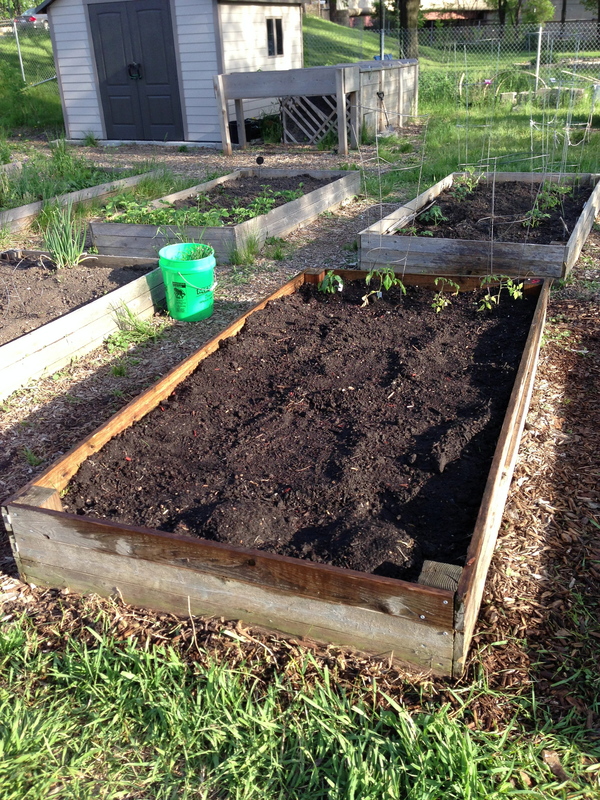 There is still quite a bit of real estate left on our plot…I’m thinking more tomatoes. Or green beans. Or tomatoes. Definitely tomatoes. Oh, and we dug up the chive (thanks to Danielle and my dad for knowing what the big ol’ mystery plant is!) and it is now living happily (?) in a pot on our balcony. 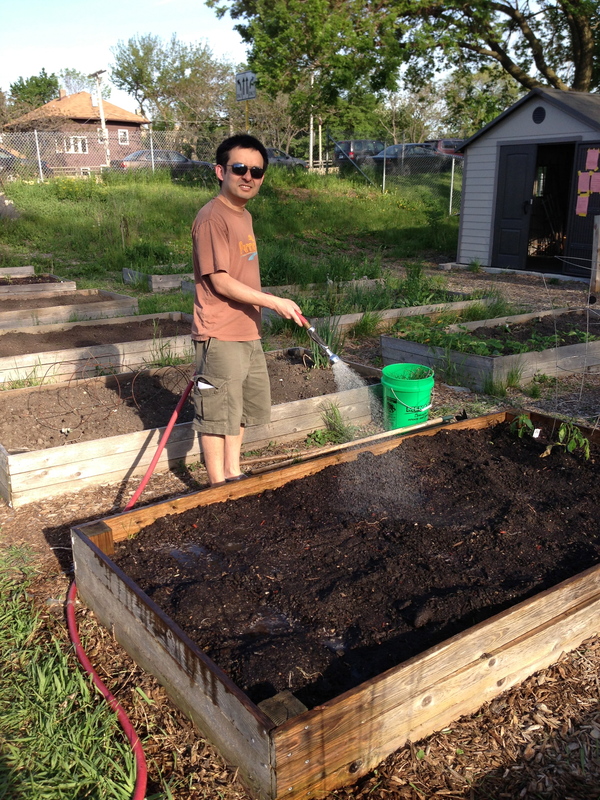 At the end, Naoto gave our garden a hearty rain shower. I’m looking forward to going back later this afternoon to check on things…and I’m trying to remain an optimist that things will actually grow! Have a good weekend! I’ll be back next week with a tasty, Naoto-approved somen recipe, my new favorite summer cocktail recipe and hopefully a peek at the balcony garden! Disclaimer: As much as it looks like Naoto was the only one working, I promise that is only because I was the only one taking pictures and my work went undocumented. yes, I attest to the fact that you have worked the hardest in this garden plot so far! Wow, actually planted all of that & have some room left. Hope all grows well & you enjoy your work. glad your garden is coming along. I love the little disclaimer at the end.